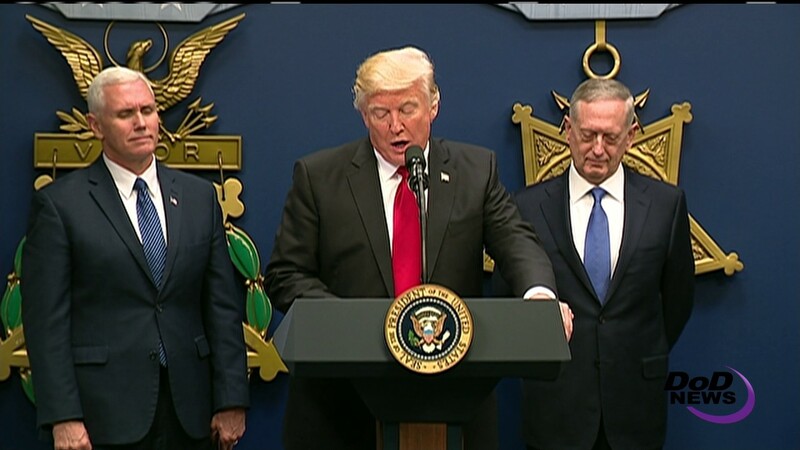 President Donald J. Trump signed two executive actions and watched as Vice President Mike Pence ceremonially swore in Defense Secretary Jim Mattis at the Pentagon’s Hall of Heroes here today. Mattis once again swore “to support and defend the Constitution of the United States” just as he did as a young Marine reservist in 1969. Mattis retired as a four-star general in 2013. The secretary has been in place since he was confirmed by the Senate on Jan. 20. He reported to the Pentagon for work the next day. The president pledged to support service members and their families. The first action initiates “a great rebuilding” of the armed services. It calls for developing a plan for new planes, new ships, new tools and new resources for the services. 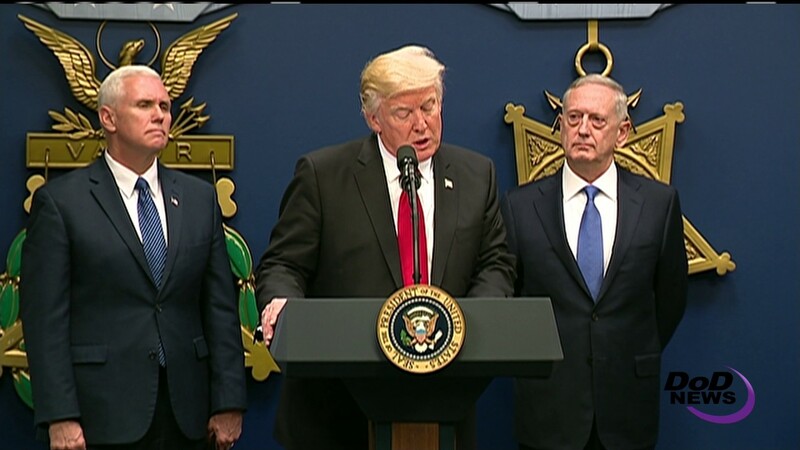 “As we prepare our budget request for Congress -- and I think Congress is going to be very happy to see it -- our military strength will be questioned by no one, but neither will our dedication to peace,” he said. Before the ceremony, Trump and Pence met with defense leaders in the “Tank” -- the meeting room of the Joint Chiefs of Staff. He called it a prudent step in anticipation of the budget process, which will help inform the secretary's recommendations to the president regarding critical military capabilities.